Packed with beta carotene, squash helps the body to make vitamin A which is important for all number of functions, including vision and bone growth. 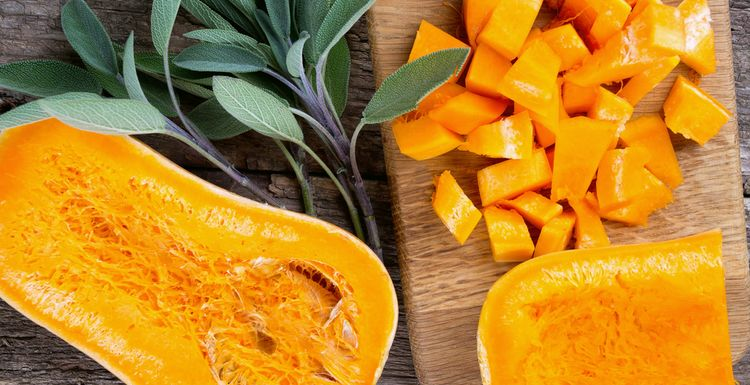 It varies between squash varieties as to how much beta carotene is contained, for example 125ml of butternut contains 4,684 mcgs of beta carotene, and the same amount of spaghetti squash contains just 45mgs – however it does contain double the Omega-3 fatty acids of butternut. The beta carotene found in squash has been found to turn on a specific gene that helps to prevent the growth of cancerous cells. Pumpkins truly are good for your eyesight. These members of the squash family are packed of the pigments lutein and zeaxanthin, two pigments which have been shown to prevent cataracts. A magnesium-rich diet has been shown to reduce the risk of gallstones, and yes, you guessed it, squash contains this mineral. Acorn squash contains around 28% of you RDA. A rich source of potassium means that squash can also combat high blood pressure, and lower the risk of developing it at all. Pumpkin seeds can be eaten as a snack and contain as much protein as peanuts, and plenty of iron.